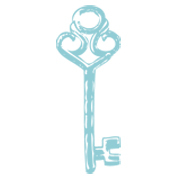 Michele Whitacre Photography | Blog: Why a Key? A photographer and her business are one and the same. If you hire Michele Whitacre Photography to capture your special moments, you are hiring Michele Whitacre. Plain and simple. So, when it came time to brand my business, I wanted a logo that spoke to who I am, what I believe, and how I live my life. My theory is that each and every one of us holds the key to our own happiness and it is up to us to find that happiness. Sometimes that happiness can be found by closing and locking a door firmly behind us, and other times it can be found by unlocking a new door in front of us. Sometimes happiness can be found by finding the guts to turn a key and walk through a door into a great unknown. We are the ones who choose which path to follow. We are the ones who hold the key to lock or unlock those doors. Instead of sitting idly on the sidelines, waiting for happiness to fall in our laps, we must actively seek it out. It's not always an easy path. Sometimes, we try our key in a door that we really want to enter, only to realize that no matter how hard we try, our key just does not fit. Sometimes we find a door that our key will unlock, so we step inside, only to realize that the room didn't hold what we were seeking after all. Sometimes we stumble upon a door that we never expected to open for us, but when it does, we decide to enter on a lark. Once inside, we realize that sometimes we don't know exactly what we are seeking until we find it. Then there are the doors that seem to unlock, almost before we turn the key, and beckon us inside. The ones that know we belong there, even before we realize it ourselves. Over the years, I've certainly stood outside my fair share of doors, pounding helplessly, desperate to get inside, but no matter how hard I tried I just couldn't get it to unlock. I've also spent a lot of time wandering around trying to get comfortable, only to realize that I was in the wrong room all along. I've unlocked doors only to instantly realize I picked the wrong one and couldn't get it slammed closed fast enough. And then there was that one door. The one I opened on a lark. The one I never expected to be the one. Only it was. And once inside I realized that happily ever after isn't reserved just for fairytales. And finally, there was the door that almost dared me to open it. The one that seemed to know where I belonged, even before I did. That's the one that lead me here. I never set out for this to be my path. I never even thought about being a photographer before it happened. Yet from the moment I turned the key and decided to enter the unknown world of photography, I can't imagine a life without it. When it came time to brand my business, I didn't have to stop and think what my logo would be. I knew instantly. I've always known. Because there is nothing in this world that could possibly symbolize who I am and what I believe about my path through life more than a key. I still remember when you got your key tattoo and the post that went along with it. It's inspired me to get a key on my arm in white ink once I graduate college to remind myself that I'm the key to my success and how far I've come. What Does It Truly Mean to Rescue an Animal?